Overview. The Hidden Worlds of Noise and Voice (2002: Golan Levin and Zachary Lieberman with the production of Ars Electronica Futurelab) is an interactive audiovisual installation whose central theme is the magical relationship of speech to the ethereal medium which conveys it. Participants in this exhibit are able to "see" each others' voices, made visible in the form of animated graphic figurations that appear to emerge from the participants' mouths. In the Hidden Worlds installation, users wear special see-through glasses, which register and superimpose 3D graphics into the real world; when one of the users speaks, colorful abstract forms appear to emerge from his or her mouth. The shapes and movements of these forms are tightly coupled to the unique qualities of the timbres and phonemes sung or spoken by the user, thus enabling a wide range of audiovisual play. The graphics constitute a consensual hallucination which is shared by all of the participants. The Hidden Worlds of Noise and Voice is an interactive audiovisual installation, or, alternatively, an augmented-reality speech-visualization system. Its central theme is the magical relationship of speech to the ethereal medium which conveys it. Participants in Hidden Worlds are able to "see" each others' voices, which are made visible in the form of animated graphic figurations that appear to emerge from the participants' mouths while they speak. In the installation, visitors wear special see-through data glasses, which register and superimpose 3D graphics into the real world. When one of the users speaks or sings, colorful abstract forms appear to emerge from his or her mouth. The graphics representing these utterances assume a wide variety of shapes and behaviors that are tightly coupled to the unique qualities of the vocalist's volume, pitch and timbre. Hidden Worlds permits up to six visitors to participate in the consensual hallucination, enabling a wide range of engaging audiovisual and conversational play. For those who are not equipped with the data-glasses, a projection at the center of the installation makes visible the "shadows" of the virtual spoken forms. 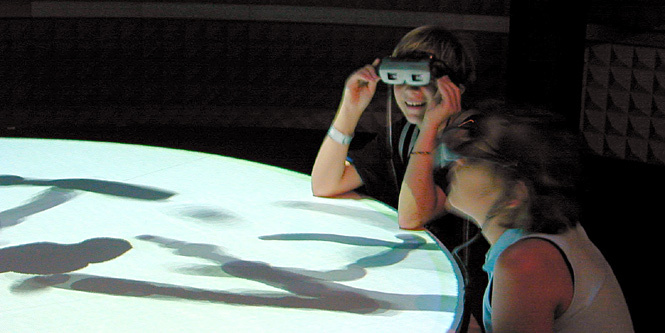 Hidden Worlds was developed in the Summer of 2002, and was installed in a two-year exhibition at the Ars Electronica Museum of the Future in Linz, Austria. The Hidden Worlds of Noise and Voice was a commission of the Ars Electronica Museum of the Future. It was made possible within the framework of the Ars Electronica Futurelab's Artist-In-Residence Program, generously sponsored by Siemens. Additional funding for the Hidden Worlds installation was generously provided by SAP. Special thanks to Malcolm Slaney for advice and assistance with the speech analysis and phoneme recognition developed for these two installations. Special thanks also to Christopher Wren for assistance with the sound-localization software. Some of the flocking algorithms used in Hidden Worlds were adapted from software originally written by Chris Kline, as ported from the inspirational work of Craig Reynolds. Thanks to Paul Davis and his colleagues for developing Jack, the low-latency Linux-based multichannel audio server used in the two installations. Thanks to the ever-brilliant Paul Bourke for his intellectual philanthropy. High-resolution photos of The Hidden Worlds of Noise and Voice are available in this Tmema photoset on Flickr.